Hello and welcome to all! If you have just joined us, I’ll fill you in: I was terrified of horses for a very very long time, but now I have my own Welsh section D called Lili (that’s her in the picture). These blogs give you an insight into my adventures and journey from being taught as a beginner on a riding school horse, and then on to learning on a different more forward horse – my own. I will take you through my experiences, challenges and eventually the steps I took and how I came to buy my own horse after lots and lots of research, hands on experience, help, support and guidance. Now up until three years ago I was absolutely petrified of horses – yes you read that right – and I mean really scared to the point I couldn’t even stand near one. So, you know, being young and very foolish at the time I decided I would have a little walk on this lovely white horse he was offering. Why not I thought, you only live once, and hey, my hair would be blowing in the fresh breeze and I would be looking at the handsome tanned guy, neither of us understanding the lingo…would romance blossom while we were having a lovely beach ride? Err no. I would be totally safe with this complete stranger on the shore wouldn’t I? Err no. To this very day, I can clearly remember saying to this guy “I just want to walk, I have never been on a horse before” and he nods and I say again “I just want to walk ok?” and again he nods. So, with a bit of help, on I get wearing a T-shirt, shorts and sandals. No riding hat, no riding boots, no body protector and no experience. Now I am sure you all know what’s coming next! This truthfully was my first time ever on a horse – well I had been on a donkey several times in Blackpool but the donkey ride was no comparision let me tell you. And so my beautiful beach ride began in walk, my legs were dangling leisurely either side of this lovely horse and we seemed to pick up pace a little, and then I held the reins a little shorter, and I was beginning to feel a little anxious because we picked up pace a little quicker still, and the next thing we were off like a rocket up the beach with the wind well and truly blowing my hair all over my face to the point I couldn’t see a thing. I was scared and started to scream real loud, we were going like the clappers full speed ahead, I was perspiring from every pore in my body and I remember looking to my right to see the guy suddenly next to me and he was reaching out with his left hand for the reins of my horse. He looked really scared too. He grabbed the reins of my horse pulling it towards him and the next thing I was mid flight in the air, crashing onto the white sands flat on my back with this horse now rearing at the side of me. It’s an experience and vision I can so so clearly remember, and one I promise you I will never forget. Therefore my blog reading friends, that is why I was terrified to the core of horses. But it all changed three years ago, and my fear gradually started to subside with the help and trust of an amazing horse called Derry. 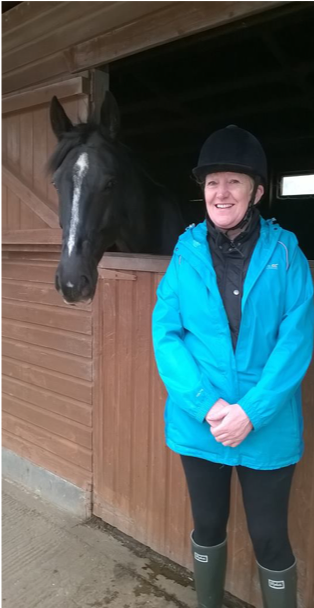 Find out in my next blog how it all began for me as I plucked up courage, made the phone call and booked my very first riding lesson with Anglesey Riding Centre. Happy reading, happy riding, happy Horse Tails From Wales.